The Chalet at The Mill Stream Run Recreation Area is located at 16200 Valley Parkway in Mill Stream Run Reservation, between Routes 42 & 82 in Strongsville – just off I-71 & the Ohio Turnpike. The natural beauty of Cleveland Metroparks provides the perfect backdrop for a winter tobogganing adventure at The Chalet. Experience the thrill of plunging downhill at up to 50 mph on the tallest, fastest ice chutes in Ohio, too. Enjoy a hayride this fall! During Saturday night public hayrides, our staffed concession stand will be open for purchases of beverages and snacks. No outside food or beverage is permitted inside the Chalet Building during public hayrides. Our Picnic Grove has picnic tables and charcoal grills available on a first-come, first-serve basis. Personal electrical appliances and extension cords are hazardous during public hours and are not permitted. Cooking is prohibited in both the indoor or outdoor fireplace. The Chalet Recreation Area is available for rentals, including family outings, group functions, company picnics and weddings throughout the spring, summer and fall. The recreation area features cooking grills, picnic tables, a sand volleyball court, playing field, horseshoe pit, swings and corn hole boards. An all-purpose trail is located near the Chalet and can be used for activities like bicycling, jogging, skating and walking. This multi-level facility provides an ADA lift to the main floor and a standalone ADA accessible restroom on the grounds, which includes flush toilets and running water. The Chalet Recreation Area is available for rent daily May through September from 10:30 a.m. -- 10:30 p.m. All day rentals are available on Saturdays and Sundays only. Rental fee includes use of the building and grounds; additional rental options include the concession area and hayrides. Reduced day rates Monday through Friday make The Chalet Recreation Area an ideal meeting place. 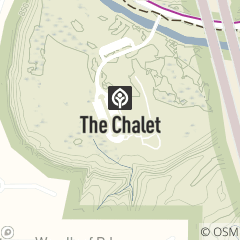 Plan your next staff or group meeting at the Chalet for a refreshing change of pace. A full-day rental includes: Chalet building and grounds, concession area, 2- 20' x 40' tents, and 3 hours of pre-event planning with Chalet staff. Additional amenities available for wedding ceremonies are 100 white wedding chairs for guests and a undecorated wedding arch for you to decorate to your wedding style. The Chalet offers private hayrides on October weekends before, during and after public hours. Reservations for private hayrides must be made in advance. Please call 440.572.9990 for more information. Private building and hayride rentals. The Chalet offers private hayrides on October weekends before & during public hours. Advance registration required. The natural beauty of Cleveland Metroparks provides the perfect backdrop for a toboggan adventure at The Chalet. The toboggan lift lets riders enjoy the thrill of plunging downhill at high speeds on two twin ice chutes. Enjoy holiday parties during non-public hours for family, companies and organizations. The concession area is available for rental at an additional fee. For more information or to make a reservation, call 440.572.9990 or visit the Tobogganing page.